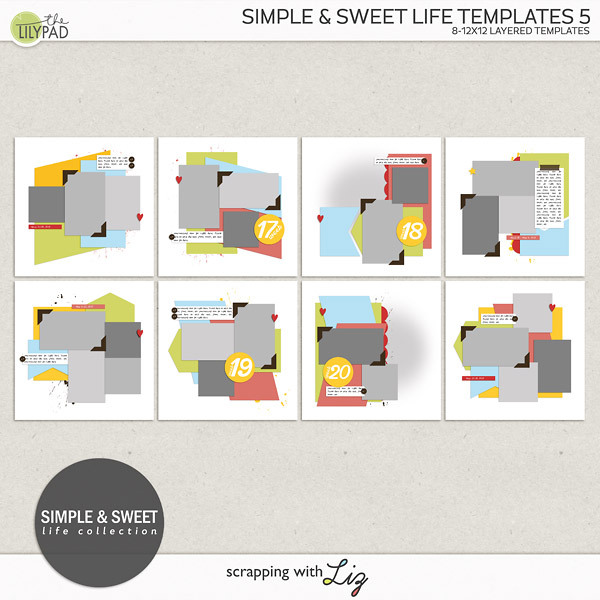 It's time for new templates for all your weekly and monthly projects! 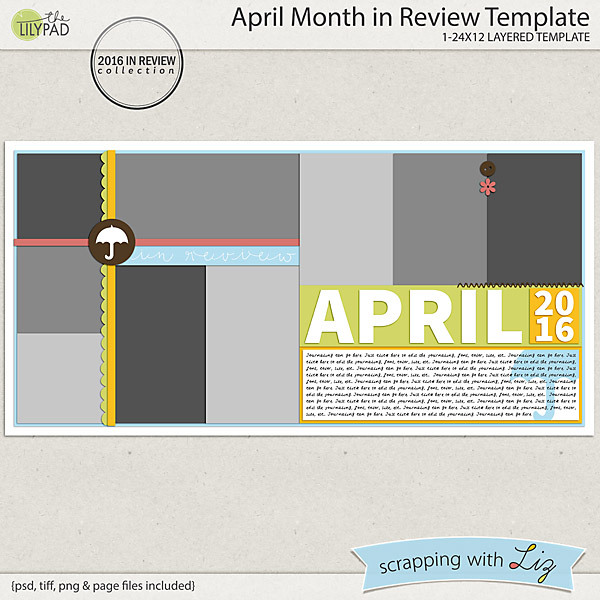 Review pages, calendars, weekly pages, Liz has it all. And everything is 20% off through May 1, 2016. 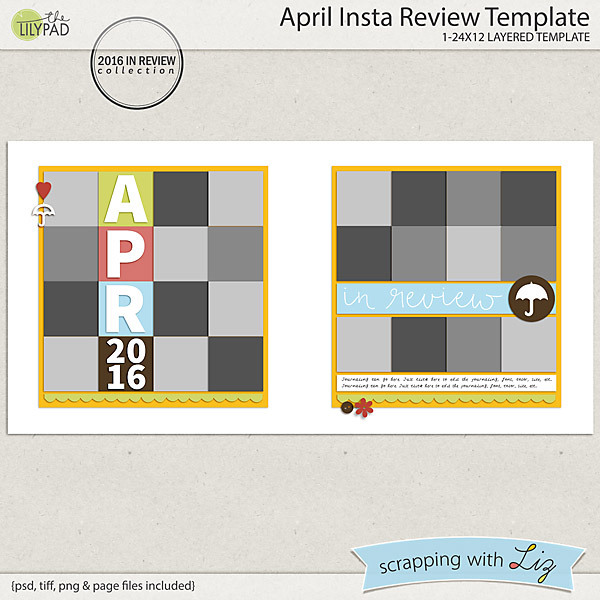 April Insta Review Template is your all your fun and spontaneous phone snapshots. 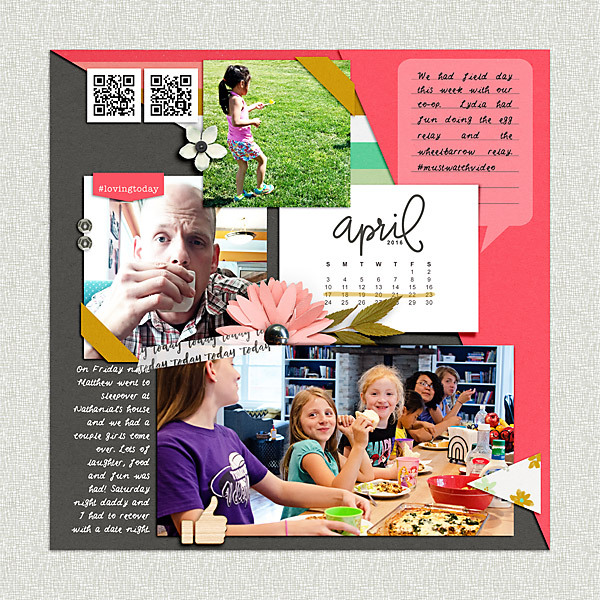 April Month in Review Template is a pretty double page spread with lots of photos. 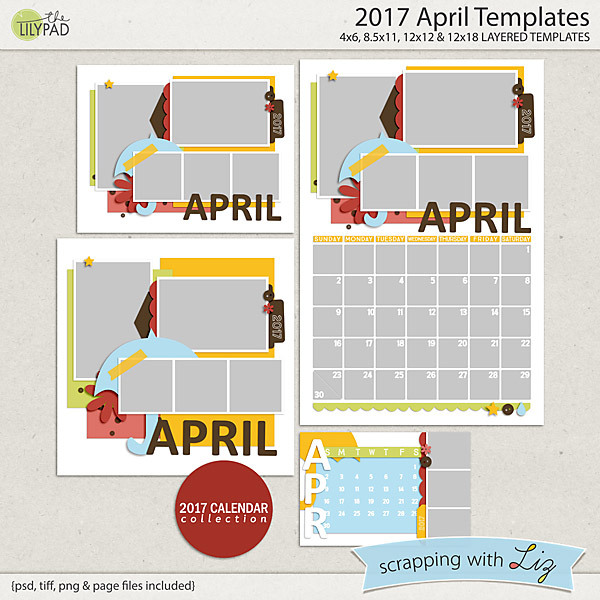 2017 April Templates has several options for making your own photo calendars. 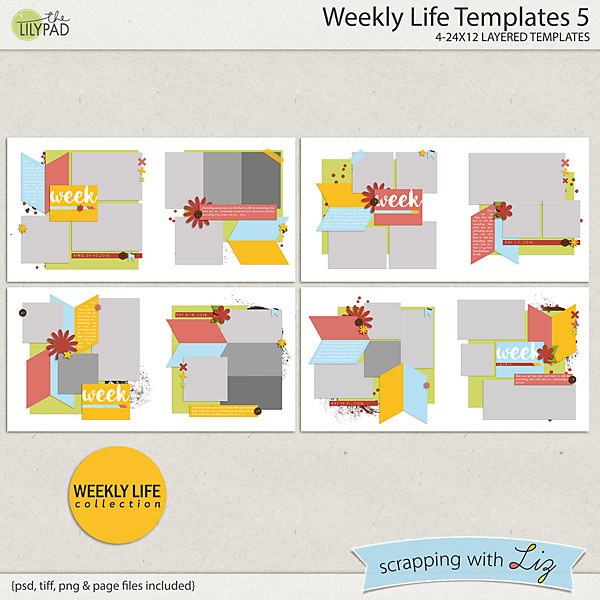 And Weekly Life Templates 5 is a new set of double page spreads with 7 daily photo spots. 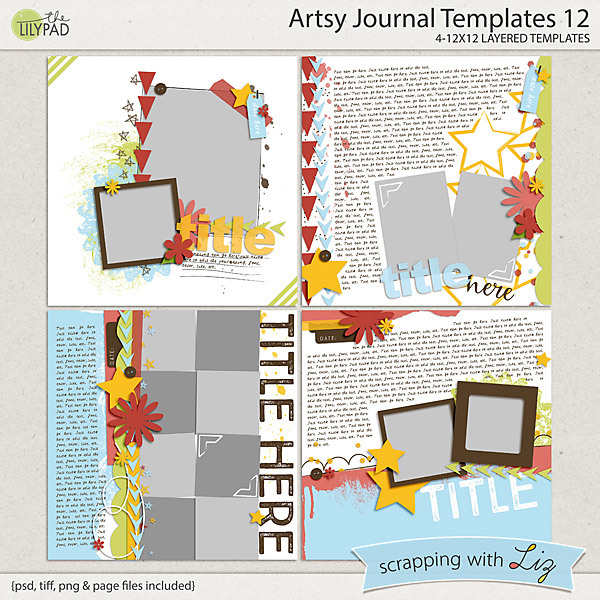 These make a great template stash too! 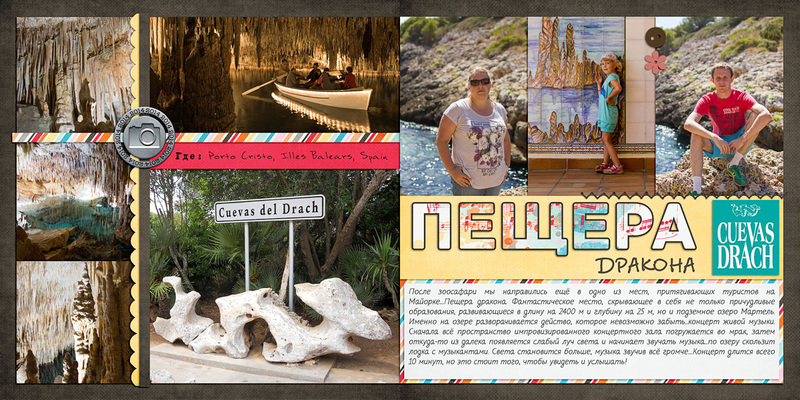 Katya made a beautiful travel page. 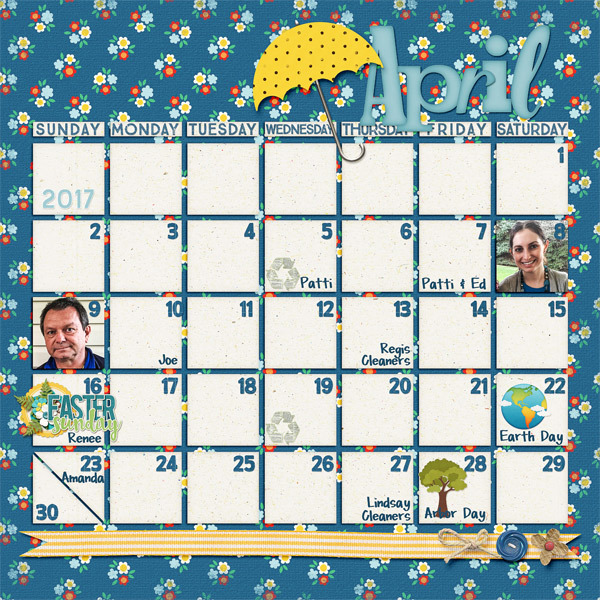 Donna made a custom calendar grid with birthdays and holidays. Rebecca scrapped a family outing. And the winner from Wednesday's giveaway is....Kristine J! Congrats, Kristine. I hope you enjoy all these new templates. Week 16 was all about the bike riding. Matthew learned how to ride his bike, and it's been non-stop bike riding around here. Whenever one of my kids learns to ride their bike we also go out for a big ol' ice cream! Matthew got his very own Banana Split Sundae, and he ate every bite (except a bite he shared with each of his sisters). Mixed in with school work and other normal activities we also played lots of games, watched Grandpa put in a new driveway for us, there was field day with our co-op, a sleepover on Friday night and date night on Saturday for mom and dad. Shwew! We packed a lot in. Take a closer look below if you want to. 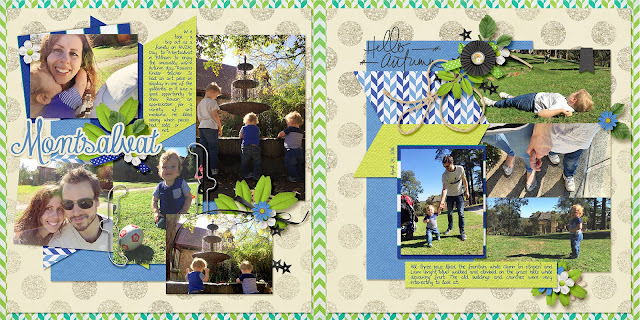 How are you doing on your weekly pages? 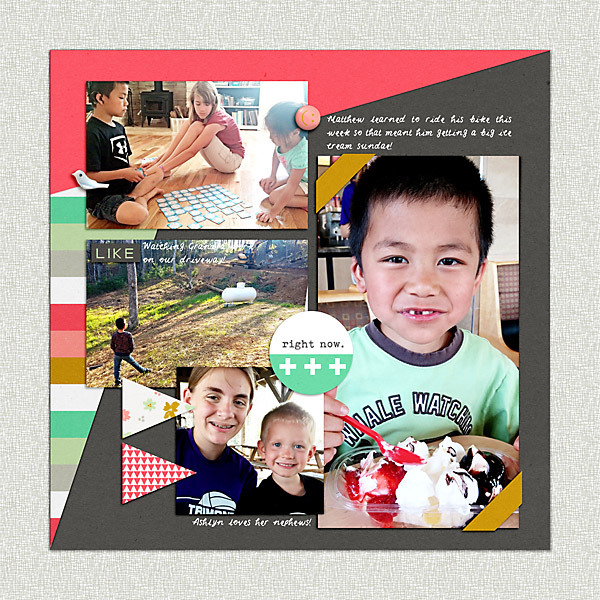 iNSD (interNational Scrapbook Day) is right around the corner (May 7th)! 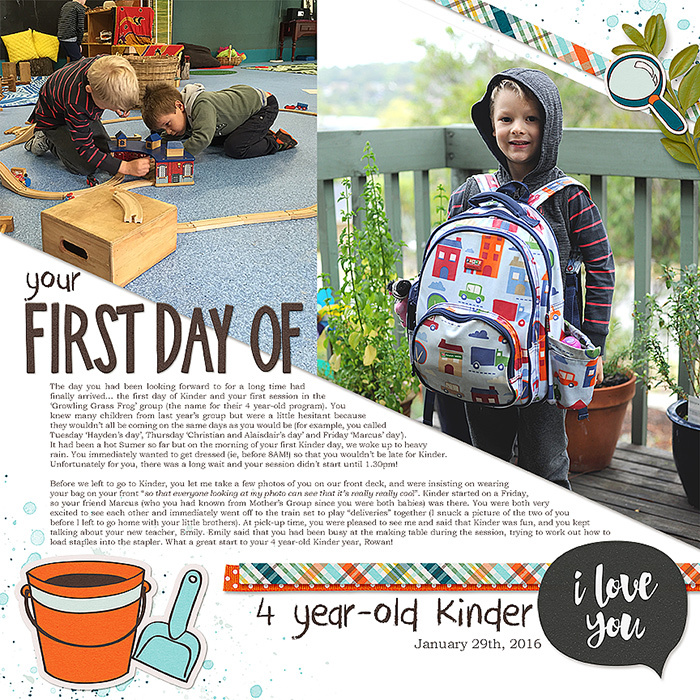 And to kick it off the designers at The Lilypad have an AWESOME blog hop for you. 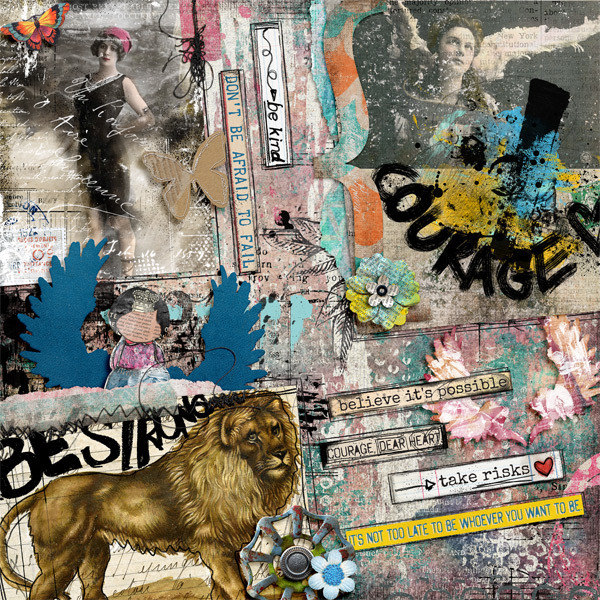 The blog hop will end on May 3rd, and then watch for Part Two Life is An Adventure Collab. It will be available as a FWP during the iNSD SALE and forum party the weekend of May 7th. 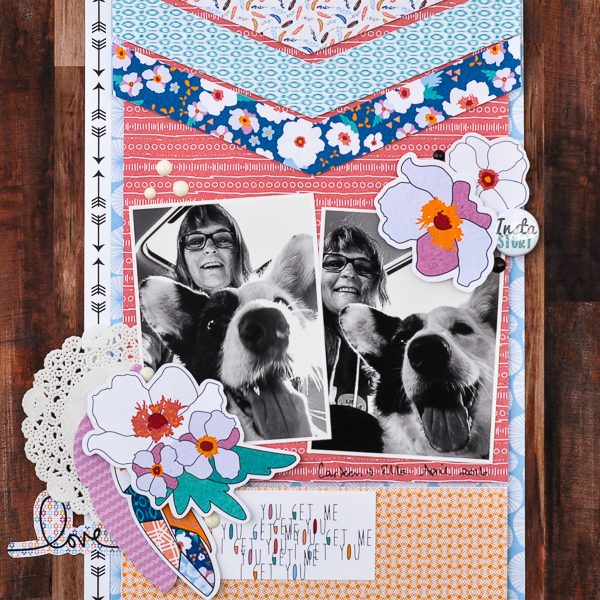 Here's my part of the blog hop. 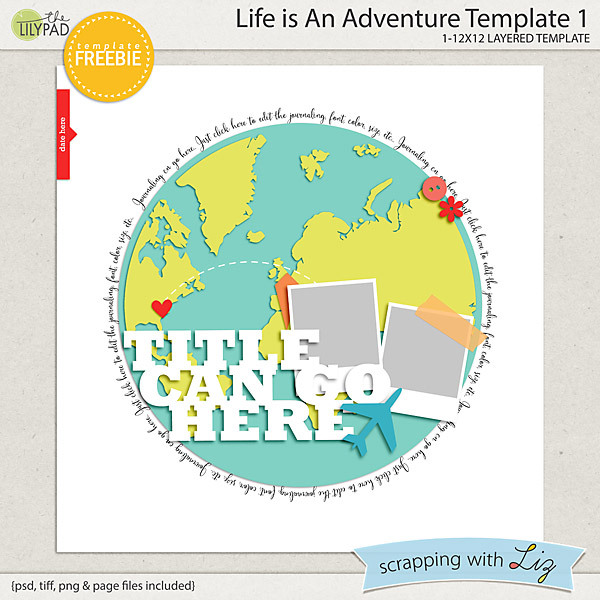 It's going to be fun to scrap some travel pages with this template and collab! Make sure you read below to check out the next stop on the hop! I also have some more freebies, games and NEW templates planned for iNSD. Stay tuned to my newsletter and facebook group to make sure you don't miss anything! And here's where you can hop on over to.... to get to the next stop on the hop! Make sure you post those pages in this album over on my facebook page. I really do love looking through them each week. I would highlight them all if I could! It's almost the end of April, and I'm back with this month Recipe challenge. 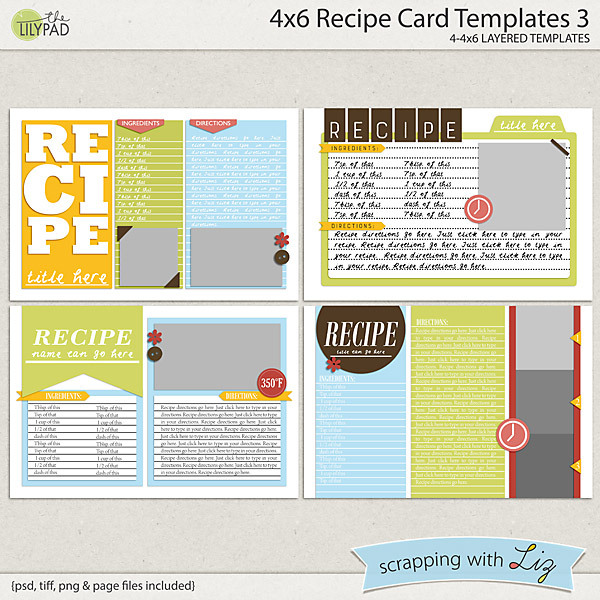 Hi, it's Donna again, and I'm happy to showcase some of Liz's new recipe cards and pages. I'm having so much fun making new recipe cards each month. I love the versatility of these templates. Don't forget that you can flip them, horizontally and/or vertically to suit your photos. 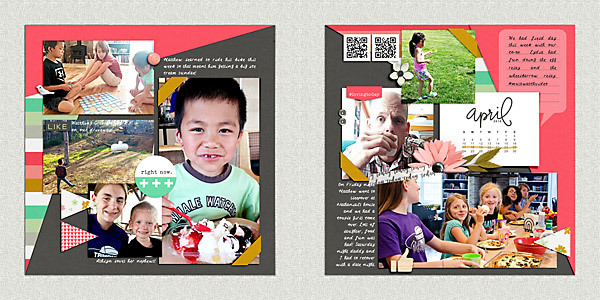 You can even use them for a non-food related layout. 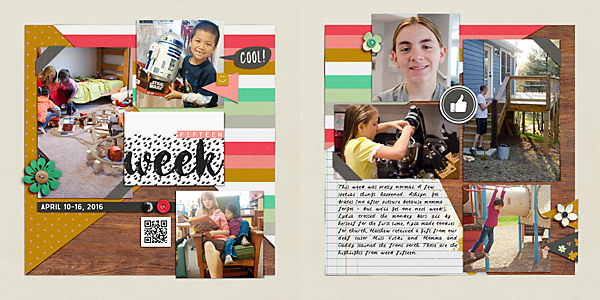 Here are some great layouts made my the ladies on the Creative Team. This one is mine. I had this for lunch and had to do a Pinterest search for the recipe. I love that Jenn used the template to scrap an interview with her son. I can't wait to see your recipes. The theme this month is Appetizer recipes. 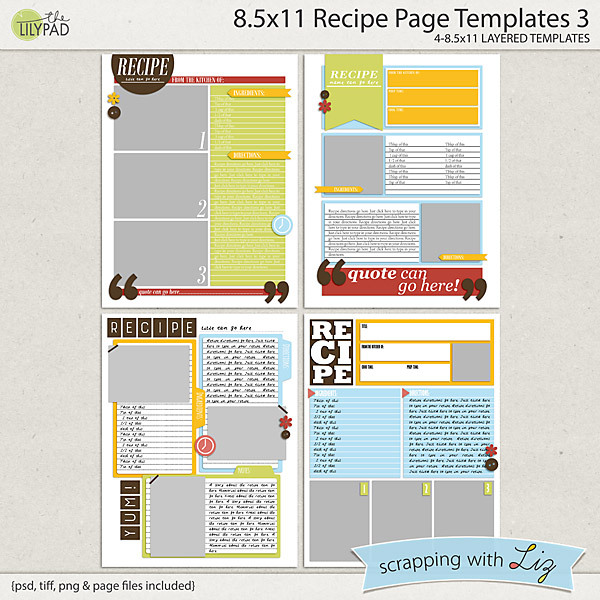 You can post them to TLP Gallery and don't forget to share your full resolution copies with us in the Recipe Challenge Album in Liz's Fan Group on Facebook. Last week I didn't take many photos, and I think that inspired me to take out the 'big' camera more this week. I'm much happier with my photo selection this week. This week was pretty normal. A few special things happened. Ashlyn got braces (no after picture because momma forgot - but we'll get one next week! 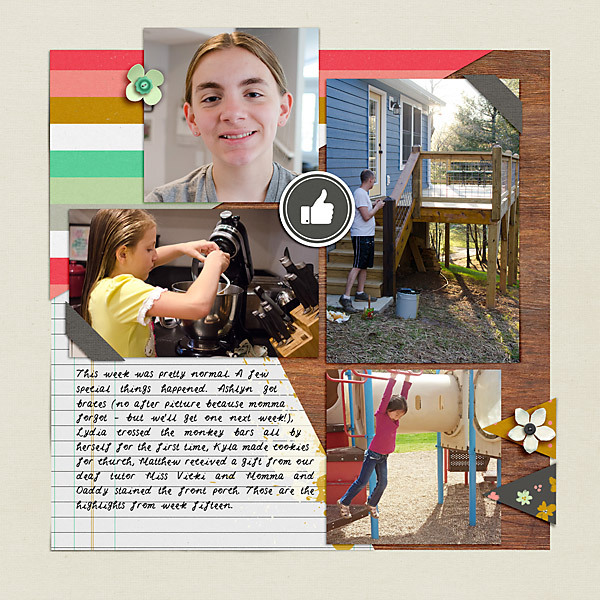 ), Lydia crossed the monkey bars all by herself for the first time, Kyla made cookies for church, Matthew received a gift from our deaf tutor Miss Vicki and Momma and Daddy stained the front porch. Those are the highlights from week fifteen. 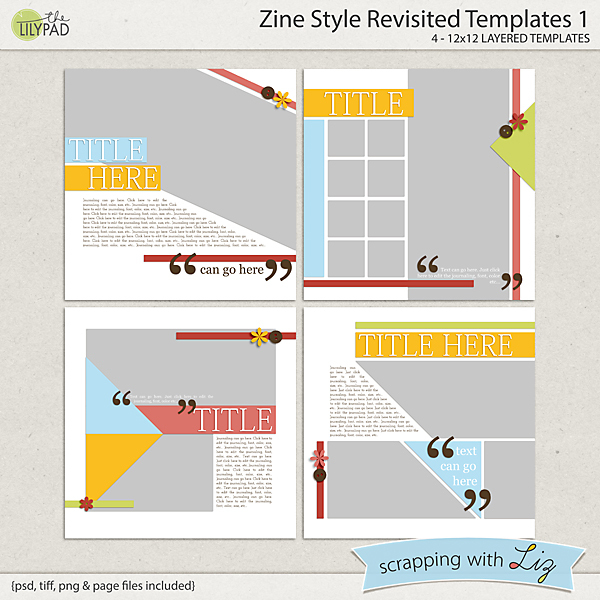 Today I have my two 'zine style templates sets on sale. These have a more flat magazine style design to them. They are really fun with lots of angled photos, bold titles, and subtitles or quotations. Enjoy the 50% SOSN discount on these products today April 20, 2016. 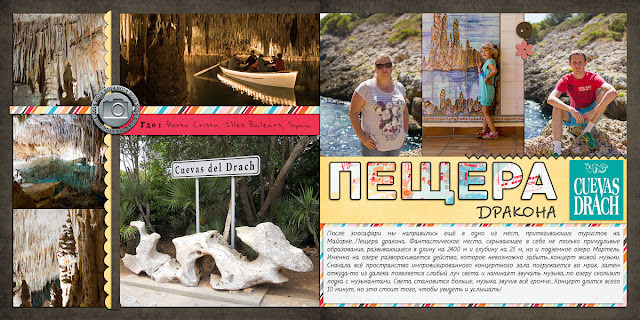 Here is Rebecca's page with Zine Style Revisited Templates 1. It looks like it is straight out of a magazine! 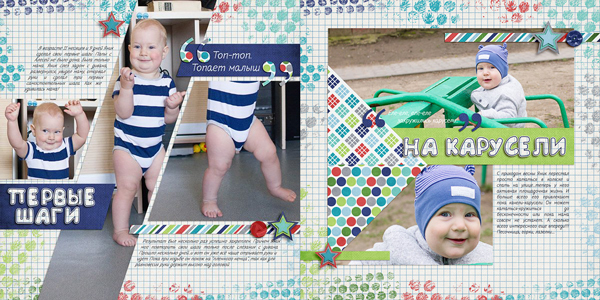 Katya used both Zine Style Revisited Templates 1 and Zine Style Revisited Templates 2 to build a double page spread. 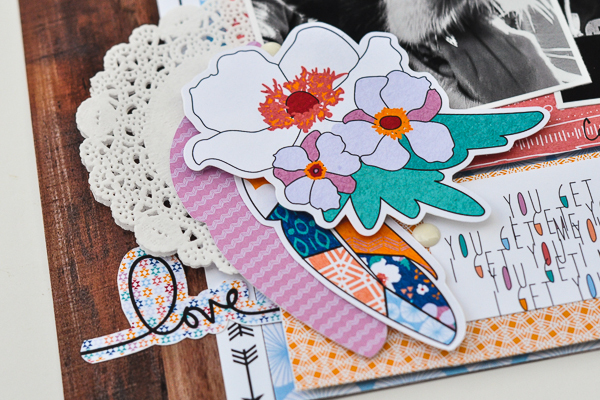 This Monday's Highlight is brought to you by Sharon and her beautiful page and adorable picture. Who could resist that face? I love Sharon's use of colors. The pop of orange among the blues and grays gives it a nice pop. 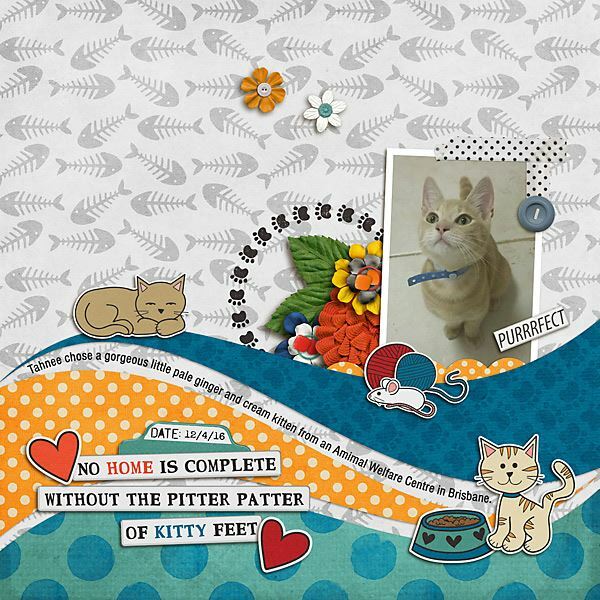 The scatter of adorable elements is a nice touch. And what a cute little saying. This page definitely deserves a highlight. Make sure you upload your SwL pages to the facebook GSO album. I check it out each week and pick a highlight for the week. You could win $4 to my store. 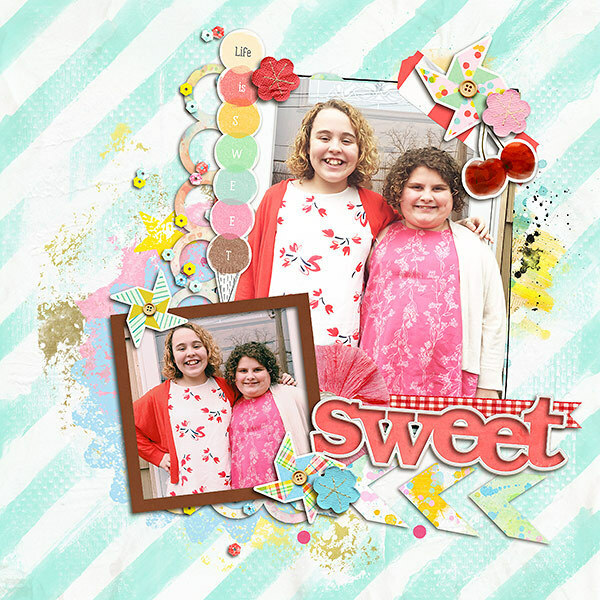 It's Katrina from Paper, Scissors and Glue here today to show you a tutorial on how to use the Scrapping with Liz templates in your Silhouette Studio software. You will need the Designer Edition version software, because you need the ability to trace PNG files, which is what we will be working with. Edited: The original version of software will trace PNG files, but you do need the Designer Edition to do the fill patterns that is talked about! 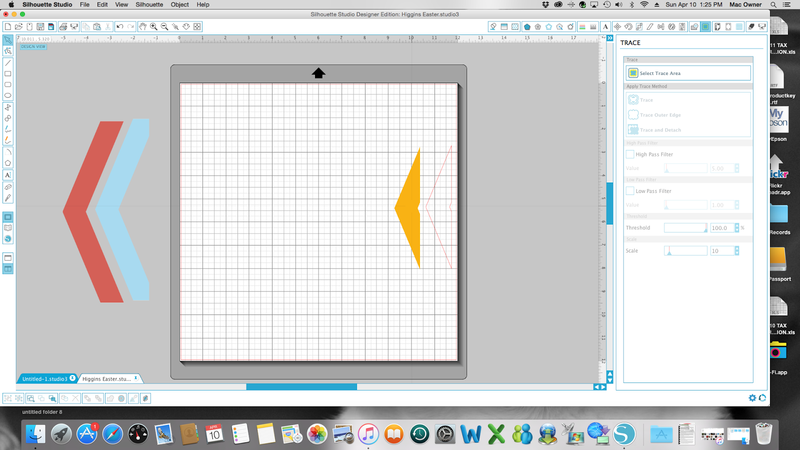 Here's the layout I am going to show you how I put together completely in the software. 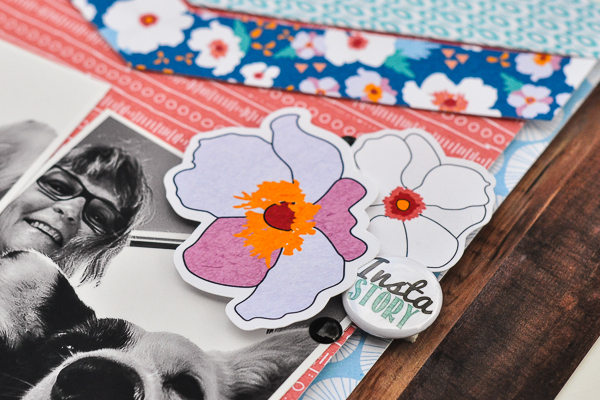 There are several different ways to use Liz's templates with actual paper products, not just digital ones! 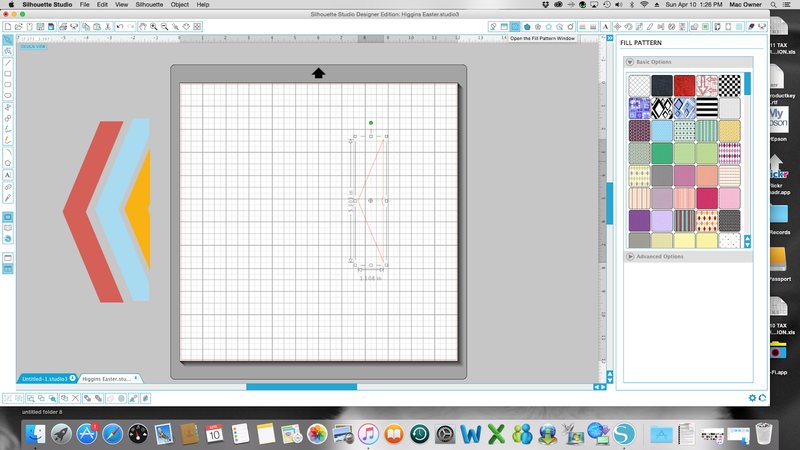 Start by opening your PNGs in your Silhouette Studio software. When I did this each PNG opened up in a new mat preview. Which actually makes it easier to trace. 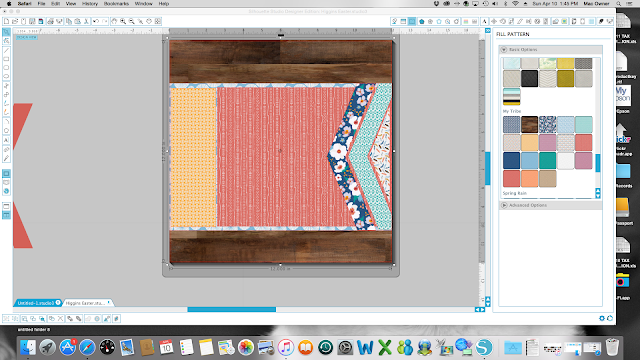 Then I copied them all over to one mat view, so that I could put my layout together. Here is a screen shot of all of them moved over to one mat view. Note, I had not traced these yet, just had them open. But they are easier to trace when they are individual. Place your PNG on your mat. Then you are going to want to select the "TRACE" feature. It is the sixth button from the top right edge of your software, it's highlighted in blue here. The trace options will open up and you will want to click on "Select Trace Area". This will allow you to draw a box around your shape. The box will be grey and you will be able to adjust the size to fit your shape. The "High Pass Filter" box will be checked, you need to uncheck it and moved the "Threshold" up to 100%. When you do this it will fill in the shaped of the PNG a bright yellow. 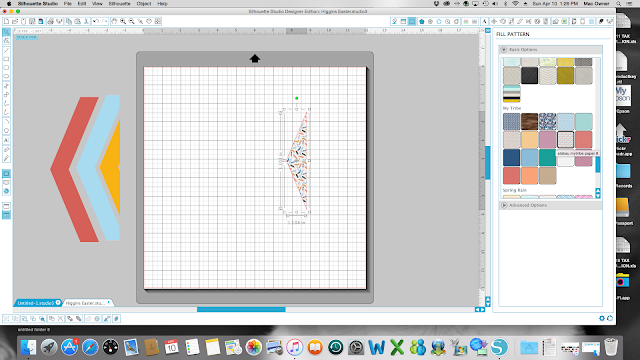 You want to make sure the shape is completely filled in and then you will hit the "Trace Outer Edge" option. Once you click the "trace outer edge" there will be red lines (or whatever color your cut lines are set to) appear around the edge of the shape. If you look below, you will see once I moved my PNG shape out of the way I am left with the same shape with cut lines. Woot, now the fun begins!! 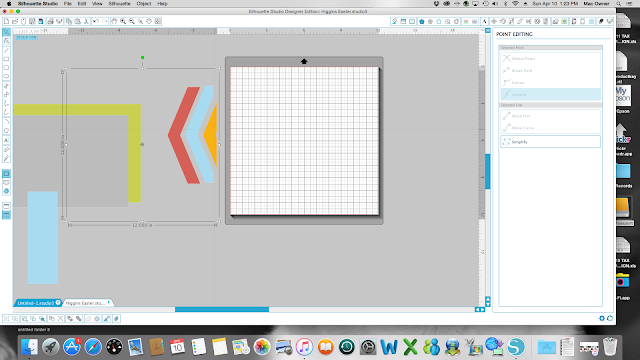 Now, you can either cut the shape out of pattern paper, or you can fill it with patterns that are loaded into your software. Don't worry, my next post will be on how to get those patterns into your software! There are preset patterns in the software that you can play around with to get an idea of what to do. If you select your shape and then select a pattern, your shape will fill with the chosen pattern. You can just pick and choose until you find one that you like! I did the pattern filling with every shape that I traced, since I was using a digital kit. This allows me to see if I like what I have created before printing. I print each piece individually and then put the layout together by hand. I place as many pieces on a 12x12 sheet as I can, to save on paper. Or you can just cut the shapes out of actual paper that you have on hand! 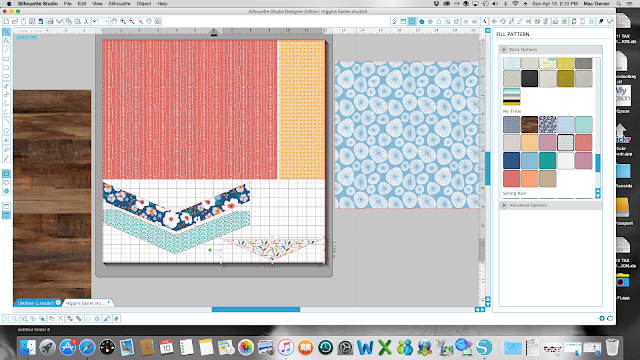 I wanted to play with these patterns though, since I splurged and got a wide format printer. 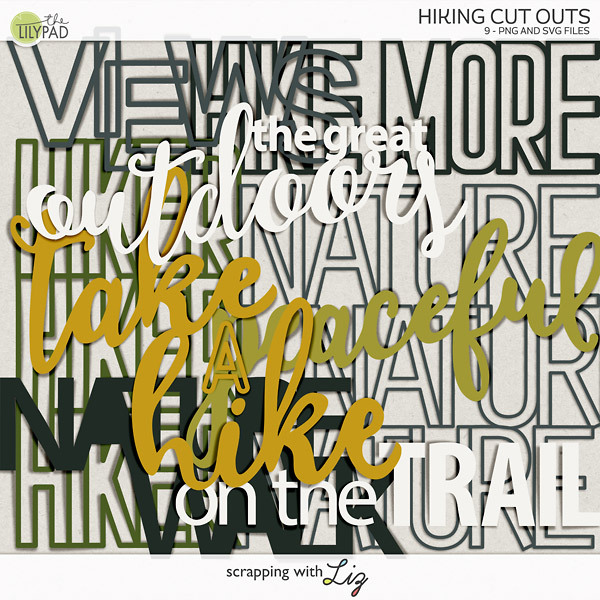 Now, you can print and cut these all in the Silhouette software, but I actually just printed and then used my trimmer and scissors to cut them. These were easy, straight lines, some of the other shapes it would be better to print and cut if you are using digital papers. Now the fun part for hybrid scrapping is actually putting the layout together with all the little details that you can add! 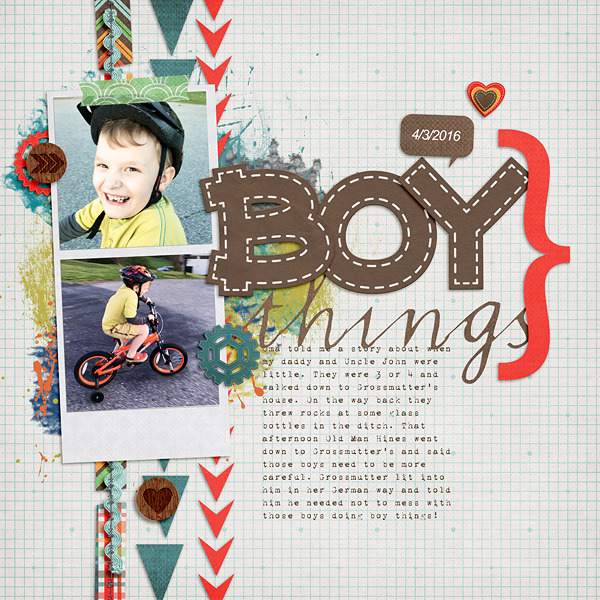 I did use the Print and Cut feature for elements of the digital kit I was playing with, but that's for another post! 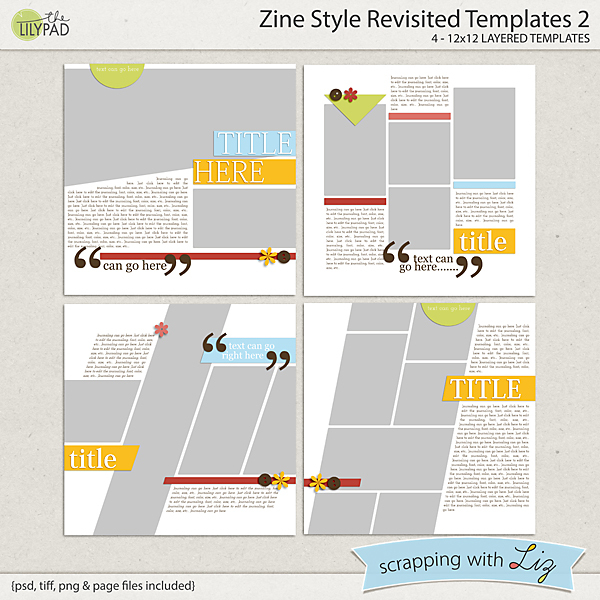 I will be going into more details on how to incorporate Liz's templates into your own scrapping and hopefully maybe making you pull some paper out of your stash OR nudging you to step your toes into digital if you are a paper scrapper. It's combining the best of both worlds for me!! 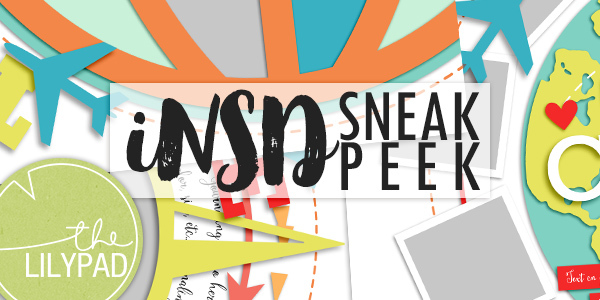 Thanks for stopping by the blog today!!! 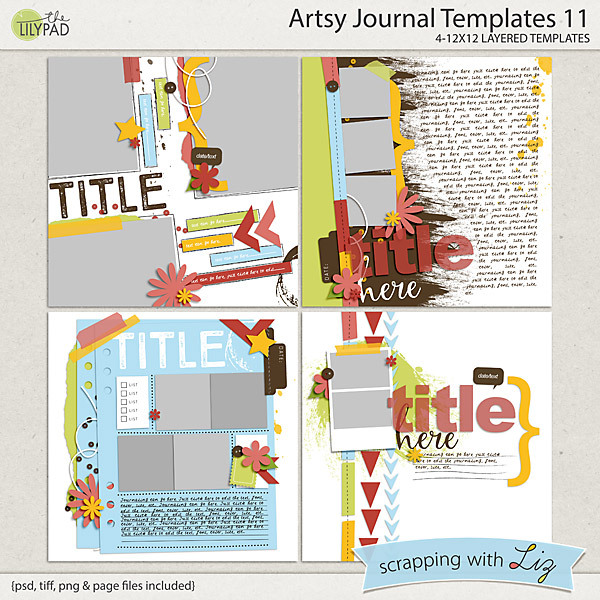 Liz has two new products in her popular Artsy Journal line. 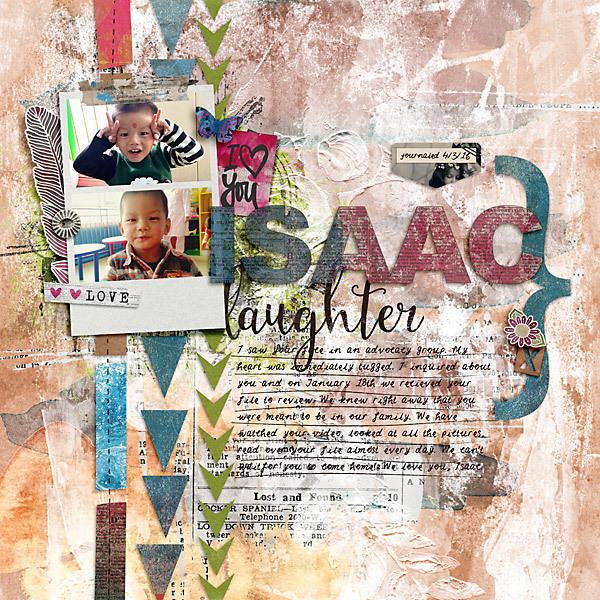 These artsy templates are full of paint splatters and fun paper pieces, and some of them have LOTS of journaling. They are on sale 20% off through April 17, 2016. And the winner from Wednesday's giveaway is....Pam K. Congratulations!